Nobody expected to see the new champion so soon. Kayn was released not so long ago, but developers decided to surprise us again. We can propose that the new champion will be mediocre and Ornn is looked so at the first glance. But let’s try to dig a little deeper and look at the passive ability (Living Forge) and the Ultimate (Call of the Forge God) especially, so this champion starts to shine with new colors. Passive is really unique, this ability allows the champion to buy items from the shop right on the battleground, without the need to go back to the base. Basic abilities of the Ornn is simple and clear, but the ultimate is quite interesting. The thing is in the flexibility of this spell, with the right skills, you could easily turn the fight on your side. Ornn’s appearance is very brutal and all his abilities have interesting animations and particle effects, but it is still not the time to evaluate his true strength. According to his abilities, I could assume that Ornn will be Solo Top or Jungle Champion. Here you could watch a gameplay video of the Ornn, the Fire below the Mountain. The main features of the Ornn are the ability to buy non-consumable items right on the lanes, and his ability to upgrade some of the basic items dramatically boosts its stats. These Masterwork upgrades provide a huge advanced to your team, but every player of your team could have only one masterwork upgrade at a time. Forgefire Cape (upgraded Sunfire Cape) – provides enhanced values of health and armor (+625 health and +90 armor), but the damage of the passive ability is still the same – 12-29 magic damage per second to all enemies within 325 range. Cost – 1000 gold. Infernal Mask (upgraded Abyssal Mask) – this upgrade increase all stats of the Abyssal Mask except CDR and mana (+500 hp, +90 magic resistance, +300 mana, +10% CDR). Cost – 1000 gold. Molten Edge (upgraded Infinity Edge) – this upgrade adds 30 damage to the infinity edge, and that is all. Not the best choice for the 1000 gold, but if you already have all items, then it is still an upgrade. The Obsidian Cleaver (upgraded The Black Cleaver) – All stats of The Obsidian Cleaver a little bit greater, except the CDR (+550 health, +60 attack damage, +20% CDR). Rabadon’s Deathcrown (upgraded Rabadon’s Deathcap) – this upgrade adds 50 AP to the item, and that is the quite interesting addition, for the 1000 gold. Trinity Fusion (upgraded Trinity Force) – the most precious upgrade that Ornn could offer, this item have increased stats, except CDR (+350 gold, +50% attack speed, +35 attack damage, +8% movement speed, +350 mana, +20% CDR). Salvation (upgraded Redemption) – great upgrade that dramatically boosts base health regeneration and other stats except for CDR, only for 500 gold (+300 health, +200% base mana regeneration, +150% base health regeneration, +10% CDR). Circlet of the Iron Solari (upgraded Locket of the Iron Solari) – the minor upgrade that adds 15 both resistances for 500 gold (+75 magic resistance, +45 armor). 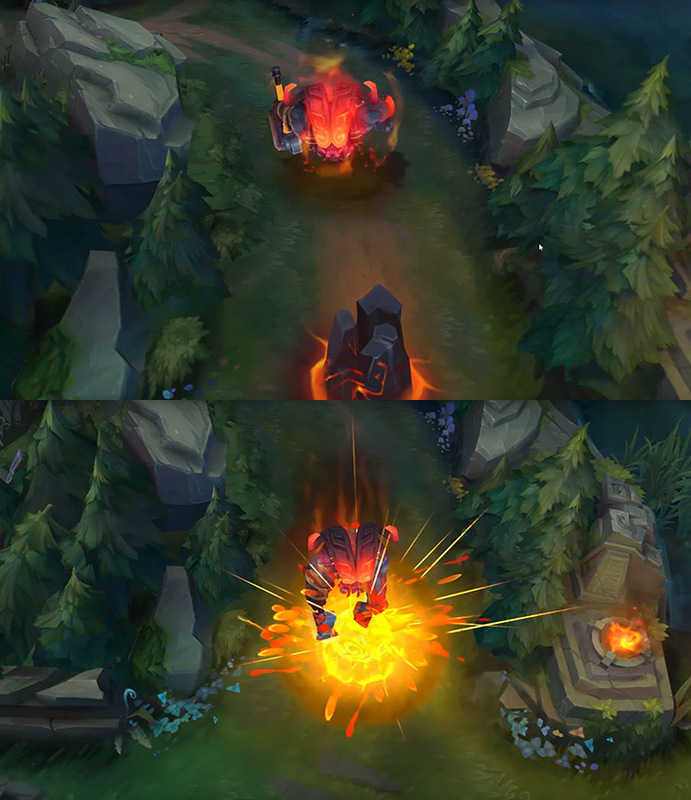 Ornn hit the ground, creating the rupture, that deals physical damage to the enemies and slow them down. After a short delay at the furthest point of this ability, the magma pillar appears, that can block enemies, as a casual wall. This is an AoE ability, and the fissure will move 200 units beyond the first champion it hits, but not exceeding the range of the Volcanic Rupture. The magma pillar that will be formed can not be used as a crowd control ability, units that were caught within will be able to move out from it. Ornn enters the unstoppable state, shielding himself and breath with fire. Fire deals magical damage, the damage depends on the target’s health. Enemies that were hit by the last pieces of the fire became brittle. Bellows Breath is AoE ability that covers the champion with a shield that benefits from shield effects, like Windspeaker’s Blessing and Forbidden Idol. 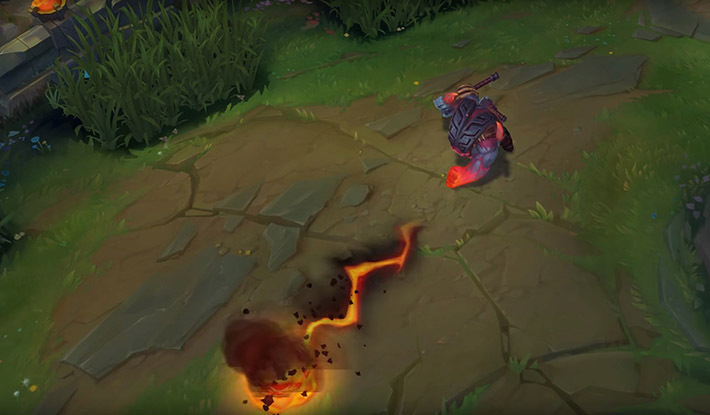 Ornn runs toward an enemy and deals damage to anybody that stands in his way, and if he hit the wall, the shock wave appears, that deal additional damage and throw enemies away. This ability can break walls, that were created by other champions. Searing charge is standard charge ability that opens its full potential only if you will manage to hit the wall. Ornn summons the giant magma elemental, that runs towards to him with the increasing speed. Enemies that were standing in the way of the elemental will receive magical damage and became brittle. Ornn could use this ability again, to charge into the elemental, and send him to the different side. After the second use of the Ultimate, Ornn’s elemental deals the same amount of damage, and still make them brittle. Call of the forge god is the great ability, that could turn the fight. But beware, the second cast can be interrupted by stun, knockdown, and Ornn can not hit the elemental if he is grounded. If you decided that you do not want to send the elemental to the different position or just simply miss the opportunity, then the elemental will continue approximately 500 units behind the cast location. 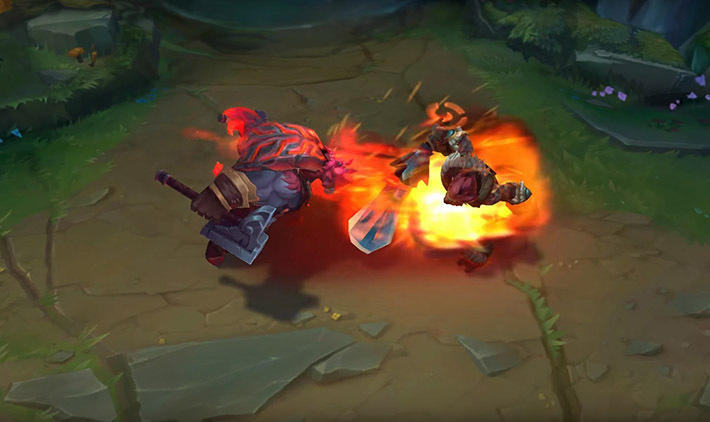 Ornn is the first blacksmith-champion in the LoL, and that why developers have unlimited ideas about in-game mechanics. In other games, blacksmiths are mostly support-heroes, but not in the LoL. Riots created a champion that not only strengthens his allies but also able to be an independent guardian of the lane. The main power of the Ornn is in his ability to fully control fire element. This idea was evolved by developers and now Ornn can summon a giant magma ram. Riot creates an ultimate ability for a half-god that is so fabulous and epic, that Freljord inhabitants write legends about this divine entity. All information we have was obtained from the old freljords tales, and not all of them reached our days. The scrolls that we receive tale about an ancient half-god, that was able to take the world, right after his birth. Ornn does not want to fight against humans, but the trees, icebergs, and other landscape elements is another thing. Nothing could stand against his will until he met the mountain. 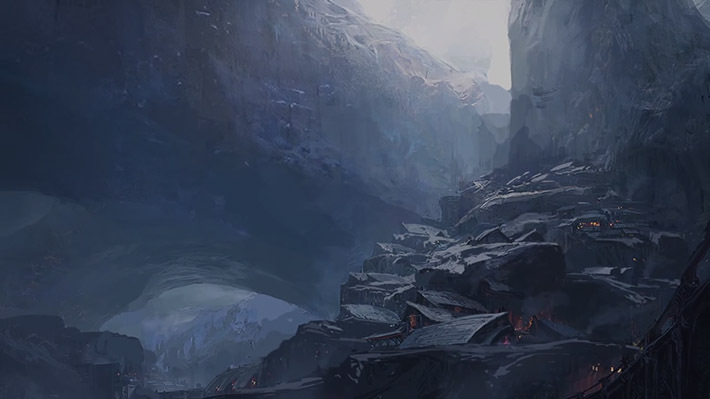 Encouraged by such a challenge Ornn starts to punch the mountain until it breaks, the Legends says that all rocks and valleys in the Freljord were created by him. Even the Earth herself admit his merits and open a path to her magma hearth. The Earth opens all secrets of creation to the Ornn and gives him a power of the fire. 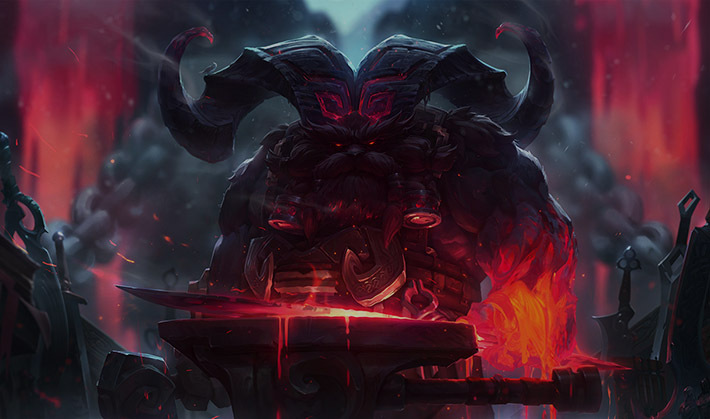 Blessed by the power of the Fire, armed with the spark of creation Ornn became the legendary blacksmith of the Runeterra. His authority was growing rapidly, as the amount of the followers. The most skillful of them lived near their god and were known as the Hearthblood. Ornn respected them for their skill of weapon creation, but the destiny of the Hearthblood was tragic. Volibear – the Ornn’s brother asked for weapons for his army, but Ornn refused his demands. Volibear enraged and for the eight days sent bolts of lightning and call magma from the depths of the earth at the home of the demigod. Nobody of the Hearthblood seen alive from these days, as the Ornn himself. Some Freljords thought that he was destroyed by the hand of his brother, other tell that he still lives under the mountain, ruling the streams of burning lava, and creating powerful weapons. But he became the hermit, to never cause troubles for his followers. Despite all his severity, he honors and loves his admirers, and the loss of his followers wounded him deeply in the heart. He saw how the intervention of the gods and humans lead to the death of the lasts. All gods drain power from the followers, and Ornn is not an exception but still, he kindly asks to not follow him. Classic Ornn represents this demigod as a Fire lord, that fully controls magma and fire elemental. All his skill shows his fire nature. 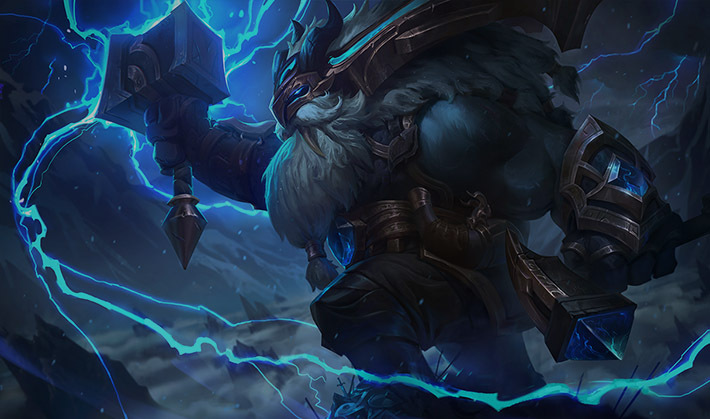 The second skin greatly changes his nature and with the alternative skin – Thunder Lord Ornn, and now he is a Thunder divinity. And this is the really great skin for Ornn, not only the appearance of this champion has changed, but also all his abilities, even the Ram now has thunder nature. New sound effects and all other elements of the Legendary LoL Skins.